Today, The Genographic Project officially announced the launch of their new Geno 2.0 project, a significant update to the type and quantity of genetic information that will be collected and analyzed by The Genographic Project. The new project will use an entirely new SNP chip (the GenoChip) designed specifically for Geno 2.0 in order to provide the world’s most detailed information about Y-DNA and mtDNA haplogroups (using SNP information) as well as detailed biogeographical estimates and ancient population (Denisovan and Neanderthal) estimates. As of today you can pre-order a Geno 2.0 kit, which is expected to ship no later than October 30th (although you can probably expect it earlier than that). Once again Family Tree DNA will perform all the testing, and The Genographic Project has worked very closely with FTDNA to design, troubleshoot, and use the GenoChip. 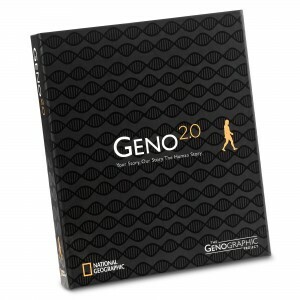 FTDNA will perform both the Family Finder and the Geno 2.0 test. ... Click to read more!